1. Pre-heat oven to 170°C. Grease and line a 6 inch round pan. In a large bowl, combine together flour, sugar, baking powder, salt and baking soda. In a separate small bowl, mix curd or buttermilk, oil, vinegar, vanilla extract and apple sauce. 2. Stir the wet ingredients into the dry ingredients bowl until just mixed. I added another teaspoon of curd to adjust the consistency. Add 2-3 drops of desired colour. Quickly mix well. Pour the batter into prepared pan. Bake for 25 minutes or till the tooth pick inserted near the centre comes out clean. Cool the cake completely in the pan before de-moulding. Freeze the layer till further use. Bake 2 more layers using different colors to color them. 3. Assemble and decorate as per your choice. 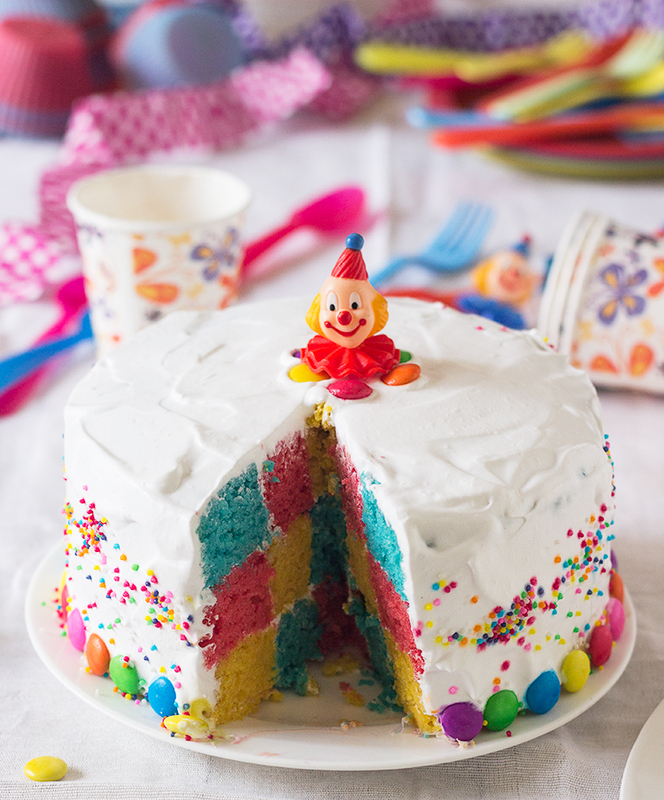 Or you can follow these steps to make a simple yet stunning Surprise Inside Cake with Rainbow Checkerboard Pattern. Cut out 2 concentric rings each from all 3 layers. I used a 4-inch lid and 2-inch cookie cutter to cut rings. Just press the cutter into the layer and using a knife in up and down motion cut out the circle. Gently remove circles and set aside. 4. Apply very little amount, just enough to stick the layers together, of whipped cream on inside of outermost circle. Gently place middle circle of color 2 inside the outercircle. Again apply light coat of whipped cream and place the smallest circle inside of color 3. Layer one of cake is ready. Remember interchange each circle with different colored ones and complete layers - i.e. Outer ring of color 1, middle ring of color 2 and inner ring of color 3. Repeat the same process to get 3 separate layers with different colored circles in each. 5. Place the first layer on a platter or cake stand. Make some holes into the bottom layer using a fork. Soak the bottom layer lightly in sugar syrup. Then apply very thin layer of whipped cream on the first layer. Place the second layer on top of the bottom layer & repeat the process of soaking & spreading filling. Finally place the top layer & again soak it. Lightly spread the filling on top & sides of the cake making a crumb coat. Refrigerate the cake for 1 hour. 6. Frost the top layer with any type of design or decoration you like. I kept it simple. I soaked the layers lightly this time as I wanted the checkerboard pattern to clearly show and not fall apart upon cutting. You can use any color of your choice or skip the checkerboard pattern altogether and enjoy a simple cake.